A wicked sorcerer tricks Prince Achmed into riding a magical flying horse. The heroic prince is able to subdue the magical horse, which he uses to fly off to many adventures. While traveling, he falls in love with the beautiful Princess Peri Banu and must defeat an army of demons to win her heart. 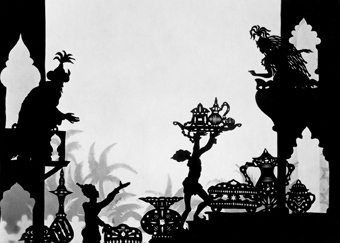 THE ADVENTURES OF PRINCE ACHMED is animated using the silhouette technique, which employs movable cardboard and metal cutouts posed in front of illuminated sheets of glass. Lotte Reiniger was born in 1899 in Berlin and died in 1981. A trained silhouette artist, she entered the film business with Paul Wegener's Rattenfaenger von Hameln (1918). With her numerous shorts, she created the new genre of silhouette films. The Adventures of Prince Achmed (Die Abenteuer des Prinzen Achmed, 1923-1926) was the result of three years of work and became the first animated feature in film history. A selection of her other films include: Cinderella (Aschenputtel, 1922), three parts of Dr. Dolittle and His Animals (Dr. Dolittle und seine Tiere, 1928), Harlequin (1931), Carmen (1933), Papageno (1935), The Gallant Little Tailor (Das tapfere Schneiderlein, 1954), The Grasshopper and the Ant (Der Heuschreck und die Ameise, 1954), Jack and the Beanstalk (1955), The Lost Son (Der verlorene Sohn, 1974), and Aucassin and Nicolette (1976).